Caring for your roses, before bringing them in, is the most important step in creating a beautiful keepsake. I work with roses when they are dry. The pigment in the rose is important to preserve as that is the color of your bead. I don't need them straight from the florist. They are meant for you to enjoy and I don't want to take that from you. When your petals start to wilt, bring them into my gallery during normal business hours where you will see a large display of items to choose from. Or start the drying process (please read below). When they have STARTED to wilt, REMOVE them from water. TOO MUCH water and time will degrade the rose and color. DO NOT put them in plastic or try to keep them damp. Start the drying process (please read below). Air dry: Pluck the petals by twisting the whole rose off of the stem. Discard the stem. Scatter the petals on a paper towel. DRY COMPLETELY and put them in a paper bag. Keep colors separate. NO PLASTIC! Microwave: Pluck the petals by twisting the whole rose off of the stem. Discard the stem. Working with 1 rose at a time, scatter the petals on a paper towel. Put the paper towel and the petals in the micro for 30 SECONDS. The petals will shrink and darken a bit. This is normal. The paper will absorb the water and be damp. The petals will stick to the paper. Remove and fluff the petals. Put them back in for another 30 SECONDS. DO NOT OVER COOK! Transfer to a dry paper towel and let them dry completely. Put them in a paper bag. NO PLASTIC! 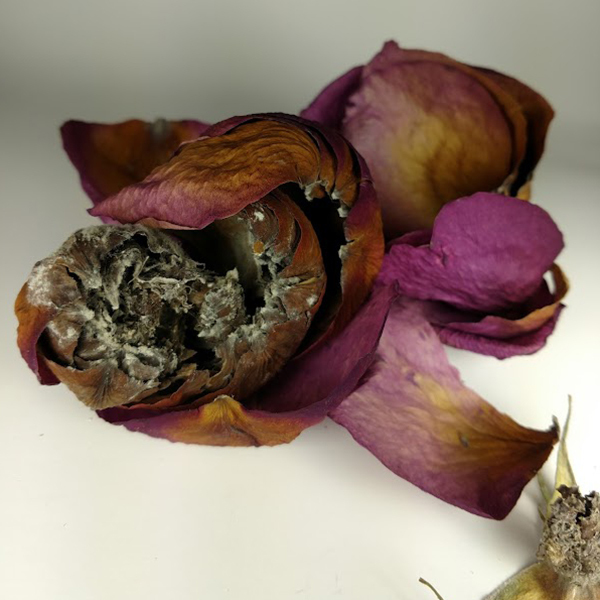 Caring for your dried rose petals You may not be able to get right in to my gallery and are concerned about storing your dried roses until you can. I've worked with a 50 year old red rose. Not all roses will keep this long. In fact, the lighter color your fresh petals are, the quicker the natural pigment will fade. When dried properly, red roses will last the longest as petals. The pigment is very strong. Pale pink, purple, yellow, peach will fade within a few months. Using these sooner than later will create the best results. The left photo is a rose that "looks" good. The outside petals are ok... but the inside is full of mold. Very few petals are useable. This client brought in 6 roses in this condition. I'm able to use the outside petals only and fortunately she only needs a couple of beads. If you have the opportunity to control how the roses dry.... PLEASE do not let your roses dry on the stem. Water in the stem feeds the rose, which could cause MOLD. And excess water will degrade the pigment of the petals. Often people try to keep the rose moist by putting it in plastic or keeping it in water. This will only make mold and/or degrade the color. IN THE SUMMER, when the humidity is high, your roses will degrade faster than less humid times of the year. PLEASE take all precautions to not allow your roses to get moldy. Summer roses vs. winter roses. There's a big difference in drying methods and getting roses to me during the extreme of these two seasons. In the summer, the humidity is high and roses can mold quickly. 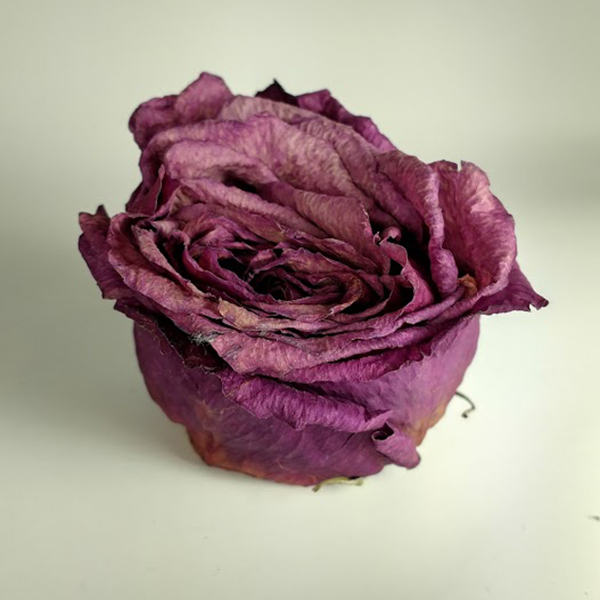 It is best to pull the petals off the stem (after you have enjoyed the rose) and dry them quickly (see HOW TO DRY above) or bring them in ASAP. Everything takes longer to dry in the summer... even my bead-making process. In the winter I sometimes receive frozen roses. They can freeze so badly that the petals become translucent and they are difficult to work with. The color can also suffer. Drying them quickly is our goal. Follow the HOW TO DRY directions above and together we'll do our best to get the best beads possible. Also, frozen roses don't yield as many beads as non-frozen roses. I create them so they will be an heirloom piece to last for generations. Enjoy them, but remember they are still a rose. Rosebeads should be treated delicately since the roses are from a special occasion. Bracelets by nature, get banged and into "stuff" as you go about your day. Special occasion wear is a good idea if you are hard on your jewelry. Pendants don't typically get abused like bracelets. Water won't harm your beads. All rosebeads are coated with 2 coats of a clear, protective finish. Some metals are sterling silver. But most metal parts are rhodium plated Britannia metal. Silver polish and harsh cleaners will harm the rosebead. Clean all metal with a dry cotton cloth. After excessive use, it's best for me to clean and recoat the clear protective finish. The metal parts can be replaced. Call me for details 781-447-2633. Excessive use/abuse, daily wear, oils, dirt, chemicals and sun can change the rosebead's appearance. Remember, your beads are organic, porous and handmade from a special rose. Rosebead jewelry should be worn with extra care to the beads. Treat them delicately. They are hearty, but not indestructible. Have your prayer beads blessed. It's against Catholic "policy" to sell blessed items. It's more special for you, or the person receiving them, to have them blessed. I also practice "liturgical correctness" when making prayer beads. It's very important that the sequence and position of the beads is proper.